no extended days off, no travel, no hotel, no food and reduced training cost. Can build a pool of trainers who can then teach the program and material to other staff for sustainability of the program. *Note: If your certification has expired and you are within your 30 day grace period you may enter the test at full price (no coupons). If a coupon/discount is utilized, that money is forfeited, the test scores are null and void and you must resubmit at the full price. This Exam is for those who are currently certified as AMD Train-the-Trainers. This exam is to Re-Certify prior to their up coming re-certification date. By completing this exam Trainers will be certified for two additional years and provided all the rights Trainers are given by Keys' to train facilitators. Upon successful completion of this Exams the Trainer will be sent the following; A 2 year Certification, Certificate of Complete for CEU Credit, Trainer Privileges and more. With the ever-increasing frequency and severity of school shootings and other forms of violence, it is time that we do something about it. Based upon International Level research by the Department of Education, Office of Juvenile Justice, the FBI, the Secret Service and others. Keys’ has developed a most unique approach to the detection and prevention of School Violence. The full training provides schools a component of a Risk/Threat Assessment Team Model. Trainer book - Crisis Recovery - Returning to Normal (CRRN:TtT) covers needed skills of a Recovery Team Member. K-RTM helps those affected by a traumatic event deal with emotional reactions, such as sadness, anger, fear and safety, caused by stressful situations. The K-RTM help staff, students and possible parents gain emotional control. Packet 2 - FULL Interactive PowerPoint Presentation on CD or Flashdrive and Black Note Slides, copy of Slides in Case. 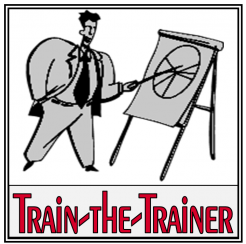 The PowerPoint will guide the Trainer through the powerful AMD Trainer Manual (free w/ AMD Trainer Training). This PowerPoint is designed to use in training AMD Facilitators by a currently Certified AMD Traininer. Packet 2 - FULL Interactive PowerPoint Presentation on CD and Black Note Slides, copy of Slides in Case. 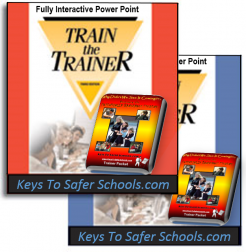 The PowerPoint will guide the Trainer through the powerful Trainer Manual and Workbook. 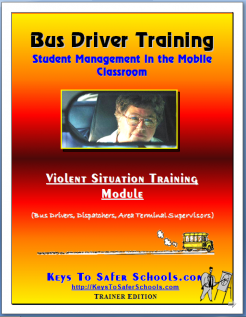 This PowerPoint is designed to use with a class of Facilitators being trained by a Certified BSWRB Traininer. 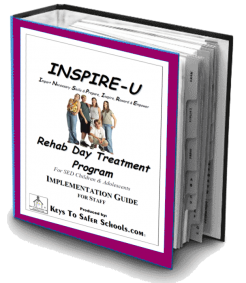 The train-the-trainer combined book and student workbook - Bullying Stops when Respect Begins is based on International level research and contains information to combat Cyber Bullying, emotional, and physical bullying by developing both an Anti-Bullying Program and a Respect Campaign.